Several new social equity pilot credits are available to project teams pursuing LEED ND or LEED O+M. This year's Atlantic hurricane season has been an example of how changes in the environment can wreak devastating impacts on entire communities. When large areas face destructive storms or fires, the most vulnerable parts of a community suffer the most. This kind of impact happens on a less visible basis in building projects all around the world. Although development can help communities flourish, too often gentrification prices out or leaves behind longtime residents. The LEED social equity pilot credits are designed to reduce disparities by recognizing projects that extend the benefits of green building to all. As part of the ongoing effort to embrace social equity as a critical aspect of sustainability, several new social equity pilot credits are available to project teams pursuing LEED for Neighborhood Development (LEED ND) or LEED Building Operations and Maintenance (LEED O+M). Like the original social equity pilot credits for LEED Building Design and Construction (BD+C) projects, these pilot credits reach beyond the project team to address the ongoing operations of existing buildings and the larger community connected to buildings and neighborhoods. Developed by the LEED Social Equity Working Group, the pilot credits align with USGBC's guiding principle to foster social equity in the 2017–2019 strategic plan by building social, environmental and economic justice for those affected by or supporting LEED projects. 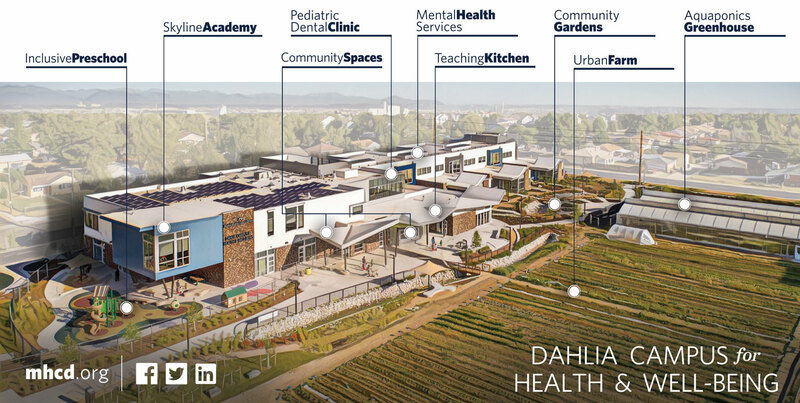 Dahlia Campus, an early adopter of the LEED social equity within the community pilot credit, developed its design to integrate various needs of the community while providing for vulnerable populations in a way that brought people together. The building, rooted within its neighborhood in Denver, Colorado, enhances social equity as part of its function. Social Equity within the Operations and Maintenance Staff: This credit will encourage project owners to create more supportive, healthier and more equitable environments for the people who keep green buildings functioning as designed. These enhancements might include life-skills training, support for financial literacy or subsidies for personal advancement, with an option to demonstrate participation in socially responsible reporting methods, such as B Corp, or other frameworks for assessment, such as GRESB. Social Equity within the Community (O+M version): The Social Equity within the Community credit for building operations requires projects to explore ways to engage and participate in the community around them. The credit is intended to be part of an ongoing process where community needs are assessed and evaluated using one of two credit pathways, a SEED network evaluation or partnering with existing community organizations. The U.S. EPA also offers the Environmental Justice Screening and Mapping Tool (EJSCREEN) for evaluating strategies to support social equity. Social Equity within the Community (ND version): Much as existing LEED ND credits connect community outreach, affordable housing and economic viability, this credit will require development plans to reflect active community engagement. Projects will use the SEED evaluator tool to better understand who their community includes and identify the needs of vulnerable populations, implementing strategies to work with the community, creating insights for improvement based on the findings of the evaluation. A demographic index of Houston, Texas, from the EJSCREEN tool reveals the distribution of low-income residents and communities of color, which aligns with many areas of the city hardest hit by Hurricane Harvey and associated flooding.